A couple of years ago I was watching an American movie translated into Italian. One of the scenes concerned a theater show; a groups of MONKS arrived on the stage and the speaker announced "Ed ecco a voi, LE SCIMMIE." Sadly, SCIMMIE doesn't mean Monks, but MONKEYS. 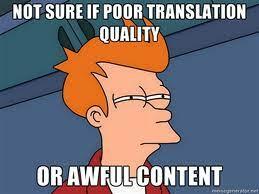 CAN YOU IMAGINE WHAT COULD HAPPEN TO YOUR TRANSLATIONS if you trust the first CHEAP translator who promises you a "perfect final product at the lowest rate"? YES! YOU WILL GET MONKEYS INSTEAD OF MONKS. And unless you decide to hire a proofreader (and if you're looking for the cheapest rate, you won't) you WON'T DISCOVER IT UNTIL IT'S TOO LATE and YOUR PRODUCT/ BUSINESS/ SERVICE AND YOUR IMAGE will be destroyed by a wrong translation. The Italian Bridge will offer you A MANUAL, CORRECT, AND MEANINGFUL TRANSLATION. - Don't have to postpone your deadlines, as we guarantee the delivery ON TIME.